So beautiful, soft, luxury looking comforter cover. Which I found this cover sooner. The bedding size is accurate. I would highly recommend this product. Sleep like royalty with the addition of this three-piece duvet set, which includes one duvet cover and two shams. This sateen duvet set, made from 100 percent Pima cotton fabric, has a 400-thread count that provides superb softness. Available in two sizes and six colors, you are sure to match your current decor. I purchased the sage green and it's actually quite soft and looks great, but it's way too big for my 88x88 down comforter. I figured there would be a 2 inch discrepency but it's more like a foot. I've been meaning to measure both my comforter and the duvet but just haven't gotten around to whipping out the measuring tape. I would still highly recommend this pima cotton duvet as I'm finding it very difficult to find any bedding that is not sateen. Sateen feels great and looks nice if you like shiny things but do not be fooled, there's a strong chance it will pill. Although depending on the thread count(higher the better) they could fall off after some wear. I don't believe this duvet will pill even though it appears to also be a sateen weave as it does have a silky shine. It's thicker than I expected making my already warm down comforter almost too hot and I live in New England, but it's not too thick it's just sturdy. I washed it and folded out of a hot dryer with no real problems of wrinkling. Now I'm on the hunt for a red duvet that's smaller and not sateen...wish me luck. HINT: always button the duvet outside in so the buttons are on the inside, this seems to lessen the chances of them becoming loose or falling off. I am very pleased with this duvet cover set. It is SO SOFT and LUXURIOUS. After one wash, it still looks brand new. I highly recommend this pima cotton duvet set if you are looking for an expensive look at a cheap price. I would be willing to try this product again. I know they were low in stock when I ordered, so we were refunded. When I first opened it, it looked okay, was nice and smooth and was the color I wanted. As I was putting it on my comforter, I noticed that there was a gap where the machine had not caught both sides. The first gap I noticed would be fixable by hand, not more than 3 inches. As I kept going, there were more spaces-about 10 inches in total. Not having a machine, I knew this would take a long time to fix. I also noticed, in the course of things, that it was missing a button on the closure flap. With everything, I decided it was time to return it. I bought this duvet set 6 months ago and I'm pleased with it. The fabric is 100% cotton and washes and wears well as cotton does. It started off super satiny and shiney, almost like a sateen cotton, but after the first washing the shine diminished a bit and it was even softer - I love how it feels. It did not shrink but I always wash dark colors in cold water and dry it on medium/low heat. I take it out of the dryer warm and put it on my comforter right away and it does not wrinkle. The fabric is a little lighter weight than I expected for 400 thread count but it still feels like good quality and is holding up very well. I have not had an issue with lint sticking to it at all. Be aware that spots do show very easily as it does with cotton - this also may be in part due to the darker color I ordered. One night I got into bed after a shower and putting baby oil on my skin. The oil was about 75% soaked in and where my skin touch the duvet it left oily marks which were very visible. This does not make me too surprised since it is cotton and therefore more absorbent compared to more repellent polyester fibers and mircrofibers. My only complaint is that I ordered the grey and was expecting a charcoal grey and when it arrived, the color is more of a purplish brownish grey. I actually have a throw pillow from another set on it that's a purple color and it matches, but I had fabric to make black/white/grey pillows to tie my room together and it makes the duvet look brown compared to real grey which bummed me out because I really love it and want it to be grey. The only reason I may replace it is to get grey or black which they don't offer in this or I would order it again. Great product, especially for the price! I was hesitant to order this duvet since there were no previous reviews, but I am glad I did. I ordered the white in king size and it fits my king size down comforter perfectly. It has a 1 1/2 to 2 inch "border" around 3 edges (all but the end w/ the button closure)- sort of like how a pillow sham is sewn. There are no keeper ties in the corners to keep the comforter tied into the duvet, but this is not that big of a deal. The fabric is gorgeous- it has a nice sateen finish that looks very luxurious and feels super soft. I haven't washed it yet, so I don't know about longevity or wrinkles, but the fabric seems good quality so it should hold up. The fabric is the perfect weight- not so heavy that it weighs down my comforter, but not so light that it seems cheap. It comes w/ 2 king pillow shams, and the same comments go for these, except that the stitching around the border of the sham is uneven (i.e., it is not sewn in exactly a straight row). I doubt this will be very noticeable to anyone but me, but I thought I would comment on this so other buyers will know. Overall, I am happy with my purchase and feel it is a good value. Thanks overstock! I was skeptical about this online bedding purchase, but I was pleasantly surprised when it arrived. I ordered the black queen-size. At first I had two issues, it was single-ply (I did not read the description as well as I should have) and it had white buttons on the closure. Well it turned about to be a nice lightweight cover, double-ply would probably make it too heavy for summer use. And the white buttons made it easy to see them on a black duvet cover and they button on the inside, so you cannot see them once closed. I washed and dried it and removed immediately from the dryer. The cover did not wrinkle much at all and it's really soft. Overall I'm very pleased. This three-piece duvet set, which is made of a 400-thread-count, smooth, long-staple “Pima” cotton, represents an excellent value for the money paid. 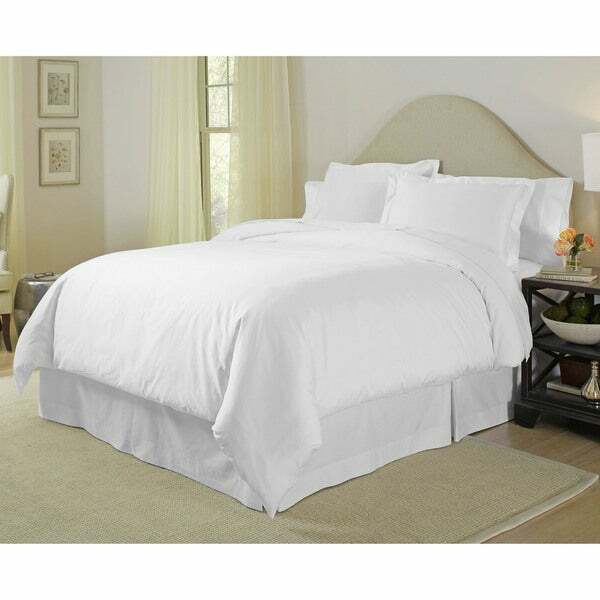 Great Duvet Cover- so soft and fits our Queen bed perfectly. I would recommend this product to ayone looking for this type of duvet cover. I ordered black and really like it. I ordered the plum color in king size. It fit my comfortervery well and the fabric color was very accurate to what was on the screen, very dark & rich looking. The fabric is soft & looks good on the bed. The reason I gave this 3 stars is that the pillow cases faded (dramatically).. After a few washes, they were many shades lighter than the duvet, which had been washed just as many times and in the same load. I do not know why the duvet didn't fade (not even a little) and the pillow cases did (a lot). Anyway, I had pillow cases that matched my sheets, so I just use those now and it looks fine. Nice to touch, easy to maintain, wash, I really recommend it! This is an excellent Duvet and while we like it very much the pillow shams are a tad small. They’re only good for small pillows and not anything too wide or hard. Your basic standard feather pillow is fine but that’s it’s limit it seems to me. Love this material, washes nicely. This set is very soft and the color is rich and beautiful. I ordered the plum and the color is way better in person. It is a deep plum color and there is a sheen to it that makes it look richer and more expensive than it is. Very soft, good quality. Would recommend it. Thin, light and does not wrinkle in the dryer. If that's what you want- go for it. Feels really luxurious and high quality. Very soft and well made. Withstands a lot of heavy washing too. Great buy for the price. The duvet cover set was perfect for my bedroom. It is soft and fits beautifully. Awesome duvet cover, exacts the size as stated! Beautiful cotton fabric feel, looks amazing and most importantly it DOES have the ties in the inside corners to attach to the comforter I purchased. It matches the queen size comforter perfectly! Great price too. Highly recommend this one! Excellent quality. So thick and soft and gets even better after washing. I bought a second set. Very nice duvet set that has held up very well over the years. Much softer and well-made than others I’ve purchased at similar price range. I’d definitely recommend it! I like this one so much, the white is snow white, quality is great, it's a good product for a good deal. I especially like the way pillows covers are designed. "Did anyone else find that when their item arrived the pillowcases were a different fabric than the comforter??" This is for a duvet set. The duvet and pillowcase fabric should be the same. Thanks. "Hi there, what are the full dimension of a California king in centimeters, please. Also it seems one can only select king/cal king but how does one know what size is eventually shipped? Unless of course you believe that king size and cal king size are the same?" "What are the dimensions of the queen duvet?" "Is the weave sateen or percale?" It is a creamy very pale yellow. "I have a question about the size of the King Duvet (102 x 82). Is the 102" measurement the length or the width?" Hello LiLi, this is approximately 90 inches wide x 106 inches long. Thanks for shopping with us! "does the duvet still have the 1-2" hem? i would prefer with the hem. and can we request zipper closer with the interior ties?" Hello snanthon, the duvet has a 2 inch bottom hem where the buttons are: There is no side hem or ties . The item is only sold as described. Thank you for shopping with us.